We ONLY buy Certified Organic produce (certified organic local farms when available). There are only few certified organic growers in our state and they are mostly seasonal. Less than 1 percent of all U.S. farmland is certified organic. So when you see the same organic farms in stores and in your order from us, that is because our choices are the same farms. 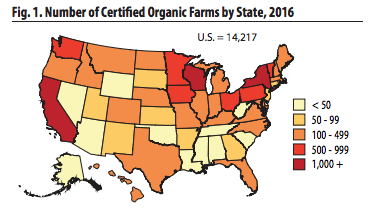 The number of certified organic farms is increasing, so please help support these farmers by buying Certified Organic produce whenever possible. ​Our produce is delivered to us the same way it is to the stores, difference is you receive it the same day. It is not going in to a back room and rotated out over the next week or two. Our goal is to give you fresh certified organic produce and save money. In your North Scottsdale Organics order you will see a wide variety of produce, which can not be grown in our heat. Every weekend we order certified organic produce from farmers that carry all the certifications for healthy certified organic fruits and vegetables. Your produce arrives at our facility every Wednesday for pre-bagging and then delivered to our healthy like minded businesses for you to pick-up the same day. We order based on our co-op families, stores, restaurants & school needs. No Commitment - order as often as you like, just make sure to order by noon Tuesday to receive produce the next day! Return Policy - We try to inspect all produce while sorting however sometimes things can get past us. Produce is perishable and we are required to report any spoilage to the farms within 24 hours of receipt for a replacement. If you experience a problem please email a picture and a note by noon the following day of pick up (Thursday) to ordermybag@cox.net. Thank you. Membership - You do not need to join, however, Members receive a $5 discount per bag!